The Parisian art gallery C LAGENCE is currently presenting the most recent work of the Greek designer and fashion editor Thanos Kyriakides, who participates in the Men’s Fashion Week and the Haute Couture Fashion Week in the French capital. The exhibition of his art project «Blind Adam» is organised under the aegis of the Press and Communication Office of the Greek Embassy in France and in collaboration with the Association of Young Greek Professionals of Paris. 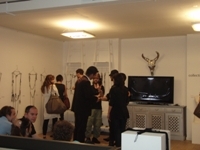 In the framework of this event covering the period June 25th to July 7th, a cocktail reception for the press was offered on Saturday, June 27th, at the forementioned gallery in the centre of Paris. Thanos Kyriakides was born in Athens in 1971. He is working as a fashion editor since 1990 and during this period he has collaborated with many Greek style magazines, such as Vogue, L’Officiel, In Style, Harper’s Bazaar, Elle, Esquire etc. In 2002 the artist was stricken by a genetic disease provoking gradual loss of vision, a misfortune that incited him to look for new ways to express his creative imagination. This is how the art project with the symbolic name «Blind Adam» came into being two years ago. The artist has chosen to work with wool strings, developing new talents that arise from the acute tactile sense he is now acquiring. The basic idea of his art consists in the creation of pieces made from assembled wool knots. The « blind Adam » art project combines various elements the designer selects from his most preferred artists, his works being mostly inspired by the artwork of Jean Cocteau, Giacometti, Da Vinci, Pollock, Magritte and Dali, but also by the “Emperor’s new clothes” fairy tale and the Braille writing method. Kyriakides wishes to play with the idea of the “invisible clothes”, producing works that, apart from their clothing function, present a magnificent art installation as well, while calling for reflection on themes like vision and blindness, real world and spirituality.